In all the time I’ve been posting about the various model-making activities I do I have blithely assumed you will understand what I mean when I spout a scale at you. I’ve realised, of course, that many of you won’t have a clue how big something might be, even with the benefit of a scale ratio. I’ve decided to adopt the idea, quite frequently used to identify scale in photographs, of using a coin as a reference. 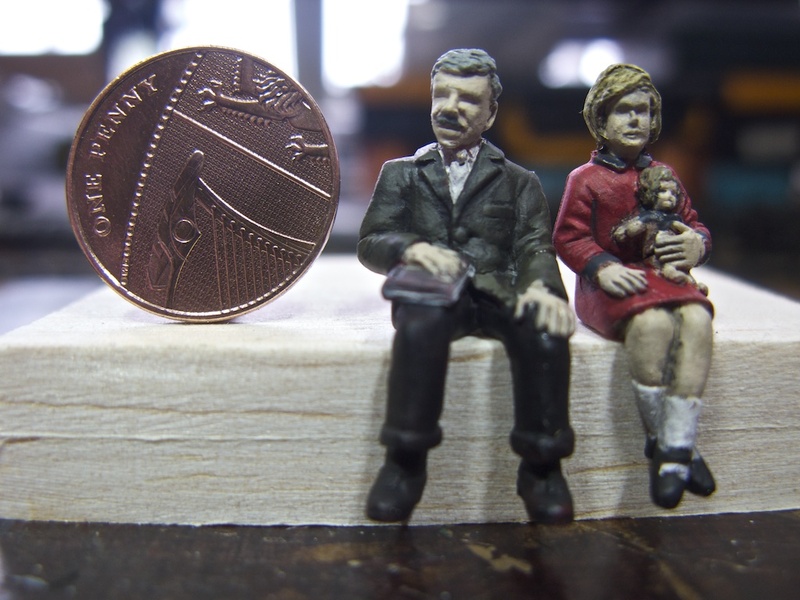 It won’t appear in every shot I take of my models, but when I think it needs clarification I’ll pop in specially trained British penny. It won’t hurt to explain the scales and ratios a little better anyway. I’ll begin with the largest scale I work in, 1/43rd. These figures appeared in an earlier post. They are to 1/43rd scale, in other words 43 times smaller than the real thing. I also refer to this as 7mm scale, which means 7mm on the model equals 1ft or 305mm in the real world. In the UK, this scale is also referred to as O Gauge. 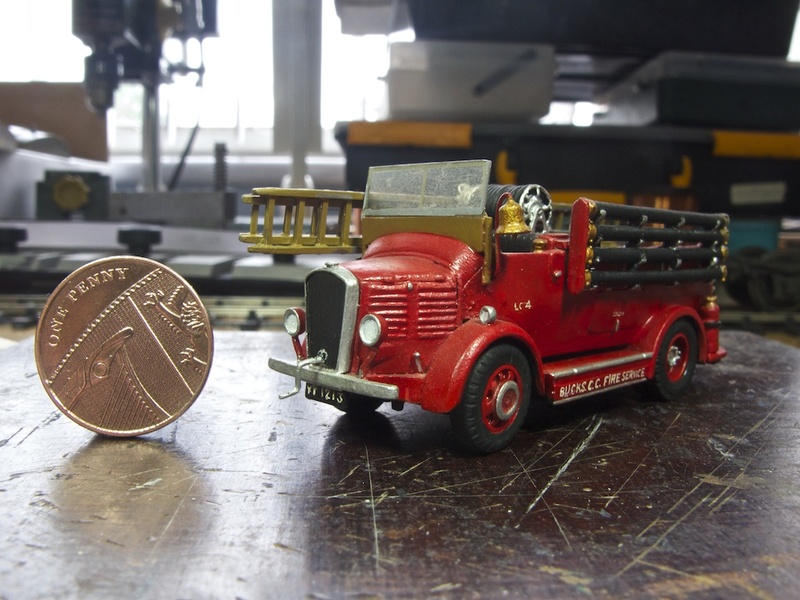 This Dennis Ace fire appliance is to a scale of 1/76th, 4mm to the foot, or OO Gauge. 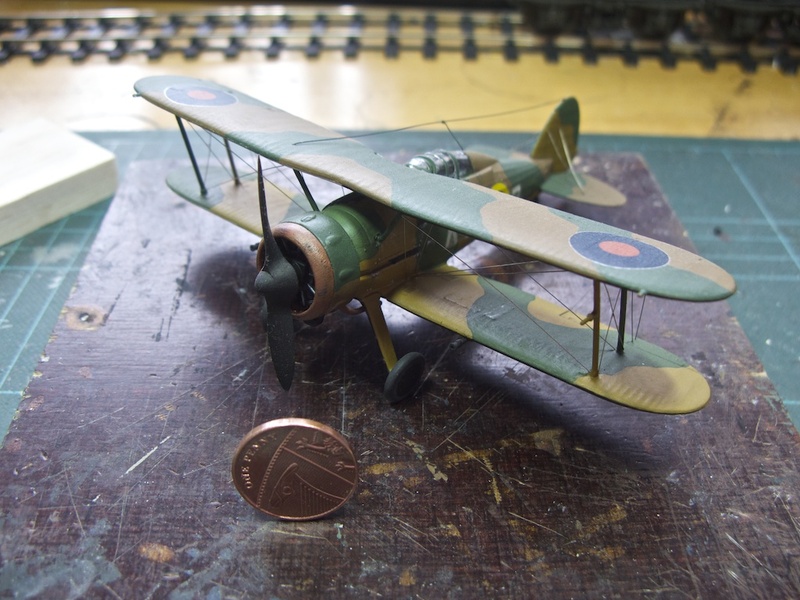 This Gloster Gladiator I is 1/72nd scale, or 4.233mm to the foot, which is an international standard scale for model aircraft. The scale is slightly larger than the British model railway scale of the fire appliance above. Interestingly, a larger “standard” scale for model aircraft, 1/48th, is slightly smaller than the British 7mm scale. Don’t ask me why these variations exist. It gets worse when you compare railway modelling scales around the world. Let’s just leave it that I work to the British scales—at the moment. It’s a funny old world when you get down to scale modelling. You are quite correct. I was trying to keep things fairly simple for those who are not acquainted with the vagaries of the scale modelling world, so keeping things rounded to the nearest whole seems sensible. I use a 7mm scale rule here (and in 4mm scale, too), which lets me measure of actual feet and inches—at least to about a half an inch accuracy, depending on how tired my eyes are. I wouldn’t be without it. You have given the 1:72 scale as something over 4mm and I haev no issue with that, you are correct. When we consider 7mm (metric) to 1 foot (Imperial) then that scale is not 1:43… rather the ratio is more like 43.543. Yes, not a lot different when written like that. However, as a friend discovered recently, setting out replacement footplate parts using 1/43 rather than 7mm to 1 foot gives trouble when those parts are put against an etched kit which was designed at 7mm to 1 foot – a small and noticable difference in length.